Fighting Fire With Fire: Why Some Burns Are Good For Nature Fire is a natural part of the western landscape, and a push over the last century to eliminate fires has threatened the habitats that some plants and animals need. In a Montana valley, fire scientists are trying to show that they can actually save wilderness by burning it. Wildfires were once essential to the American West. Prairies and forests burned regularly, and those fires not only determined the mix of flora and fauna that made up the ecosystem, but they regenerated the land. Rimmed by snow-capped mountains, Centennial Valley is about as wild as it gets in the lower 48. In part, that's because the U.S. Fish and Wildlife Service, and now The Nature Conservancy, own big patches of it and keep it wild. But what's been missing there is fire. People don't really understand that fire regenerates, and it's a natural process that the earth needs. For millennia, fire kept this place a sea of thick, knee-high sagebrush and short grass, patched with clusters of aspen trees. A century ago, the government decided to stop all wildfires. That move upset the balance of the ecosystem. The Conservancy's Nathan Korb walks me up a gentle slope, across a meadow and into a thicket of aspen and evergreens. Red tail hawks swoop above, and every now and then, you can hear the prehistoric sound of a sandhill crane calling. I can hear chain saws somewhere in the woods. Korb is an ecologist who lives here much of the year. "So we are on private lands, adjacent to wilderness," he says, "and we're trying to make the private land safe for fire so that fire managers can allow fires to burn naturally when they get started in the wilderness." The Conservancy and state ecologists sometimes start "controlled" burns to burn off high grass and undergrowth — excess "fuel" that could turn the naturally occurring fires into out-of-control infernos. Or, sometimes they let natural fires burn instead of putting them out right away — that's a choice that accomplishes the same thing. 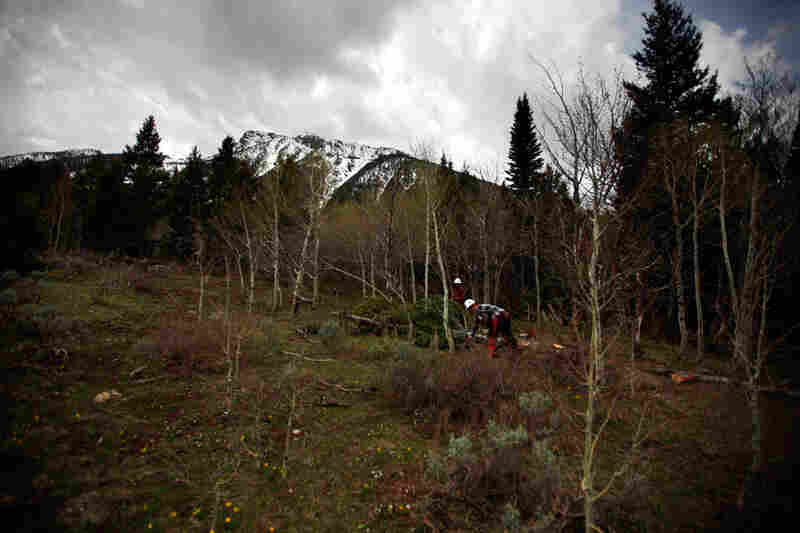 An arborist from the Montana Conservation Corps works to clear pine trees from land in Centennial Valley, Mont. Conservationists are thinning the forest of fir trees to promote the traditional steppe habitat of the area. A budding aspen tree remains standing at the base of the Centennial Range. Unlike pine trees, aspens are a natural part of the landscape here. They are largely resistant to the natural brush fires that have historically spread through this area. A view of pines and aspens with the Centennial Range in the background. The Forest Service says it needs to thin or perform prescribed burns in more than 200 million acres of land. George Johnson, burn boss for The Nature Conservancy, surveys land he was hoping to burn, but wet weather postponed the burn until the fall. In a truly natural environment, the pine trees growing in the background would not be present. 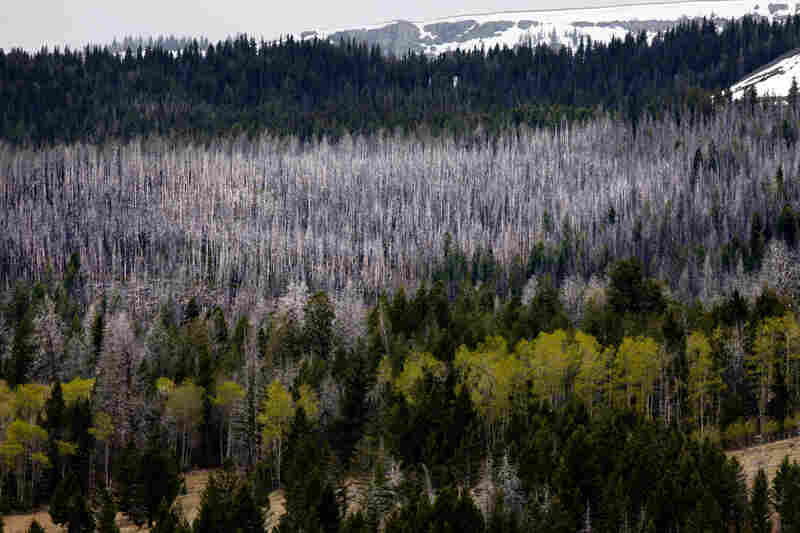 Dead trees mark the path of the 2003 Winslow fire. Conservationists have considered the fire beneficial for the steppe habitat of the Centennial Valley. Smaller, contained fires like this one have been a crucial part of this ecosystem for thousands of years. But those fires need to be managed, so a fire crew is removing fir trees. Firs burn too vigorously and can spread fire where fire managers don't want it to go, like toward ranches. And the firs really don't belong here anyway — they push out the sagebrush and actually hurt the sage grouse, the iconic bird species that lives in the valley. Hawks roost on the tall firs to spot the grouse in the brush below. The firs give the hawks an advantage that upsets the balance between prey and predator. When fires were allowed to take their natural course, the firs were burned out. But the aspen trees, which are naturally part of this landscape, don't burn as readily. Fire managers refer to them as a "wet blanket" that slows fires down. 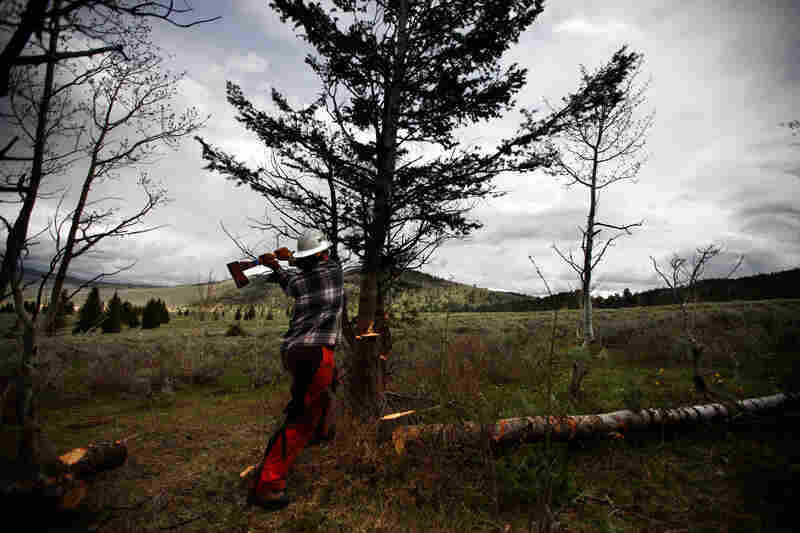 A crew in Centennial Valley is taking out the firs with chainsaws. 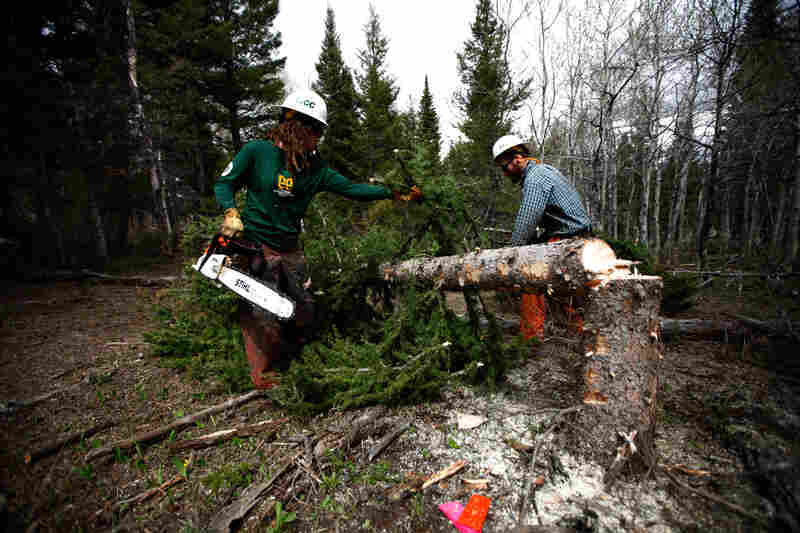 Grace Stanley, who works for the Montana Conservation Corps, puts down her saw and reaches under her hardhat to wipe some sweat from her forehead. 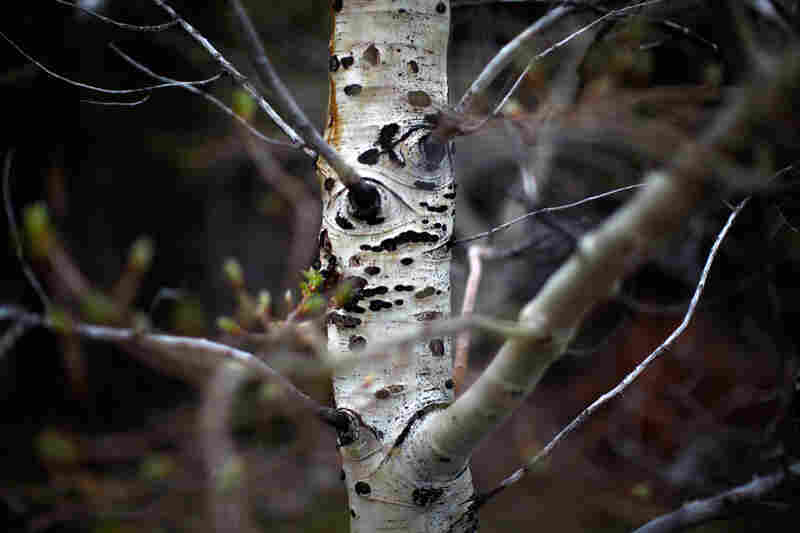 "Right now we're working to thin conifers so aspen can flourish," she says. It's a long day's work. "We typically camp. We wake up around 6 o'clock, make some breakfast, then we do a stretch circle, then we get on the saws from about 8 a.m. to 5 p.m." It's exciting work, she says, though at the end of the day, it's a little hard for her to hear. Stanley has helped start controlled burns, which, she says, scares people. "I know that every time we've done burns we get a lot of calls to the fire department, people saying, 'Oh, no, why would you do that?' People don't really understand that fire regenerates, and it's a natural process that the earth needs," she says. Down a gravel road a few miles, you can see what fire has done here. Korb and I stop and look up at a hillside that's a patchwork of green and brown. "This is the Winslow fire," Korb says, pointing into the distance. "Those two patches up there is what burned severely in 2003. To the left — those smaller patches — that's ideally what we'd like to see fire doing." The Winslow fire didn't sweep across the whole hillside as so many fires do these days. It's more like the way fire used to burn naturally, in a "patchy" way. "It creates more diverse habitats," Korb says, "different habitats for different species." 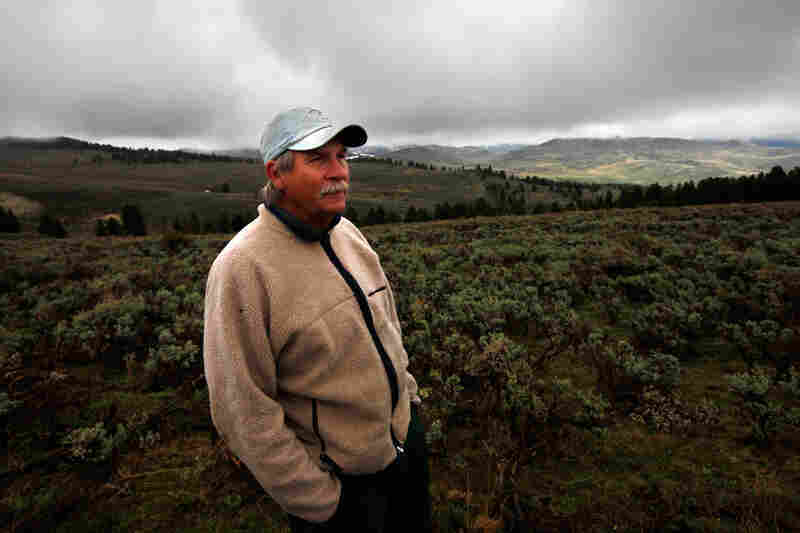 Later in the day, I meet a guy who starts fires in the area: George Johnson, the burn boss for the Nature Conservancy. He and Korb walk me up to a ridge overlooking a 100-acre valley. This is the area they plan to burn this year. "That far face over there, from the ridge line toward the snow pack over there, you come down on a diagonal to creek bottom," Johnson says. He uses the natural topography of the place, along with snow lines and damp valley bottoms and a few dirt roads, as fire breaks. "So it's a mix of sagebrush and wild rye and then the conifer that you see — that's the primary burn area." The sagebrush will benefit from this fire, and it will blunt the invasion of the conifers. Johnson is a former smokejumper with more than 100 jumps in his career. He says fighting fire with fire — literally — makes sense, even if it may not seem logical to some. "It's hard to convince people it's a good thing," he says. "They've seen too many homes go up [in flames] on the news. And it's hard to get the message across that this has been going on for thousands and thousands of years." It's not easy to bring fire back in a landscape with people and livestock and homes in it. But the alternative, says Korb, is worse. "When we light fires, we can choose the conditions that the fires are burning under," he says. That makes them easier to control. Without the kind of thinning and burning that crews like this do, the backcountry forests of the West get overgrown to the point where natural fires become unstoppable. The U.S. Forest Service says it needs to thin or do prescribed burns in more than 200 million acres of Forest Service land; so far they only have money to do 3 million acres a year. And the result is an increase in the number and severity of big fires in the West. "They are burning under the most severe conditions," says Korb, "and we're not getting patches — we're getting whole landscapes that are turning black." Scientists call this landscape change "type conversion," where the native mix of vegetation is burned out and permanently replaced with something else that's more fire-tolerant. When that happens, the mix of animals and plants that lived there changes as well, and the Western ecosystem we're currently familiar with becomes something quite different.